By Warren Fiske, Sean Gorman on Saturday, July 26th, 2014 at 7:12 p.m.
Here’s PolitiFact Virginia’s first take on Saturday’s debate between U.S. Sen. Mark Warner, a Democrat, and GOP challenger Ed Gillespie. We’ll have plenty to add in the days ahead. Warner: Gillespie backed a comprehensive immigration reform bill last year and is "against it now." But this spring, Gillespie’s campaign said he would have voted against the measure. Gillespie: "When Senator Warner first ran for the United States Senate, he said he supported a balanced budget amendment. After being elected to office, when there was a balanced budget amendment brought to the floor of the United States Senate, he voted against it." Warner backed the idea of a balanced budget amendment during an unsuccessful run for the Senate in 1996. In 2011, Warner voted against a couple of balanced budget amendments in the Senate. Warner says he changed his mind when he was governor from 2002 to 2006 and faced a recession during the early part of his term. "A balanced budget amendment for most candidates is an excuse not to give a real plan on how you’re going to get to a balanced budget," Warner recently told the Richmond Times-Dispatch, taking a swipe at Gillespie’s supports of an amendment. We rated Warner’s acknowledged change in position a "Full Flop." Warner: "As both a lobbyist and in his book, my opponent was a big supporter of the individual mandate, which is key to the Obamacare approach." In 2006, a Gillespie memoir suggested a few ways to ensure uncovered adults get health insurance. One way, he wrote, would be a requirement that people attest they have coverage or have their standard income tax deduction cut in half. Gillespie also suggested creating Health Savings Accounts -- tax-free accounts where people could save towards their healthcare costs. He didn’t signal whether he favored one policy over another. Still, his book passage could easily be interpreted as advancing the idea of an individual mandate. The Democratic Party of Virginia this spring said Gillespie’s book "promoted" an individual mandate and we rated the statement Mostly True. Gillespie’s lobbying firm was hired in 2007 by the Coalition to Advance Healthcare Reform, a group that supported an individual mandate. 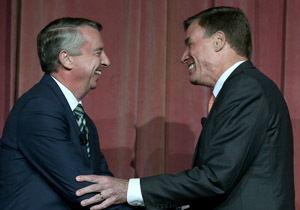 Gillespie left the firm that June, however, to advise President George W. Bush. The founder of the coalition says Gillespie helped the group organize but stated personal opposition to the mandate and never lobbied for it. Gillespie: "In 2012, despite saying he was for the Keystone XL pipeline, there was an amendment to move it forward for approval...Sen. Warner voted against it." The White House has delayed approving private construction of pipeline, which would help send crude oil from Canada to Gulf Coast refineries. In 2012, Warner voted against a measure declaring that the administration’s environmental sign-off on the pipeline the previous year satisfied all federal permitting and authorizations needed to start Keystone. Warner said then that even though he favored the pipeline, he thought it should be used as leverage to force Congress to pass a comprehensive energy bill that would include tax incentives for producing alternative energy. Outside of this vote, however, Warner has largely supported Keystone. In 2013 he backed a budget resolution calling for Keystone construction and has signed several bipartisan letters urging the administration to approve the project. Warner accurately noted during the debate that he was picketed by environmentalists in Harrisonburg last year for backing the pipeline. We’ve previously rated a Gillespie’s statement -- not repeated in the debate -- that Warner’s record is "one of acting against Keystone" as Mostly False. Warner: "The Export-Import bank doesn’t cost the taxpayer a dime." The bank is a federal agency that provides large foreign buyers with loans to purchase American products. Our colleagues at PolitiFact National recently looked at an almost identical claim to Warner’s, made by Rep. Vicky Hartzler, R-Mo. They rated it Half True.